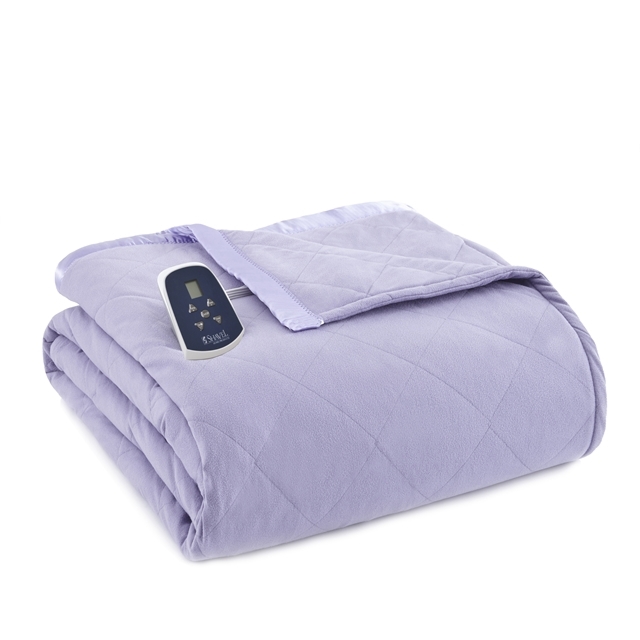 A luxurious soft quilted light purple Micro Flannel® heated electric blanket offers heated comfort and style. Preheat your bed and settle in for a warm and soothing night’s sleep. Keep everything from the top of your head to the tips of your toes toasty warm all year long with our satin-trimmed purple amethyst Micro Flannel® heated electric blanket. 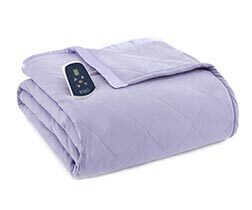 This soft, luxurious blanket brings a soft warm purple tone that feels incredibly decadent, but is so easy to care for: all of our quilted electric blankets are machine washable, bulk-free, lightweight, and breathable. Our heated electric blanket is constructed to be the coziest one around, thanks to our patented 7 Layers of Warmth™, featuring Micro Flannel®, down alternative fill, specially-crafted electrical cloth, and a quilted layer of heating elements.